Falkland wool is a merino cross that comes from the Falkland Islands. It is a squishy, soft spin with lots of bounce, and a longer staple length than merino. Falkland is my most consistent source of wool that is good for the sheep, the environment, and for us. The Falkland I buy does not have the chemical processing that is used in most commercially processed wool and so retains some lanolin and a bit of a sheepy smell when wet. Mmmm. Sheepy. Each subscription to the fiber club lasts 3 months (in this instance, Jan-March). You get 4 oz of Falkland wool in an exclusive cosymakes colorway, hand dyed by me with Greener Shades Professional Acid Dyes. You may instead choose to get a double batch (8 oz). If I have left overs of the colorway, they will not make it into my shop until at least 6 months later. You can buy a slot in my etsy shop. If you’d prefer to pay by the month, contact me at cosymakes (!at) gmail (dot!) com. If you buy a double batch over etsy, i will refund some of the shipping. Your fiber will be mailed USPS 1st class around the 20th of each month. If you have chosen the pay monthly option, expect the bill between the 10th and 15th. I will only mail your shipment if you have paid. 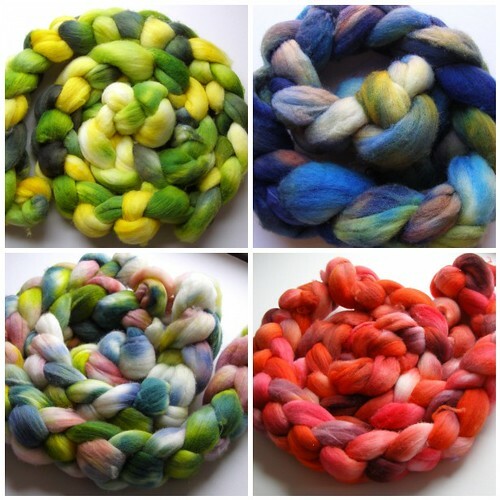 This entry was posted in cosyknitsliterally, dyeing, fiber club, spinning by cosymakes. Bookmark the permalink. I am thinking about learning to spin this year. I will start with a drop spindle lost likely, because of cost. Is Falkland a good “beginners” fiber? it’s actually a great beginner fiber! soft as merino, but with longer hair/fur lengths, so easier to manage.